By way of background to this story, two of our mentors have developed a habit of staying at the training venue in the Waterberg until late on Sunday afternoon before heading back to the city. One weekend earlier this year, they were going for a walk in the northern part of the (two hundred and fifty hectare) farm and they stumbled upon a huge Southern African Python, basking in the sun. We sent a photo of this snake to one of South Africa's leading herpetologists (a lecturer on the Nature Enthusiast Course), Professor Graham Alexander of Wits University, and asked him if this animal interests him. He replied, saying that the snake is a female, probably between four and five metres long and that (at the time) she would be looking for a mate and would be laying eggs in October...and yes, he is interested! We invited him to participate on our GraduANTs Refresher Weekend by giving us a lecture on the digestive physiology of Pythons and taking us to look for this animal. One of our mentors came up with a lovely idea, called The Amazing Race, which involved giving four teams a set of tasks to accomplish within two hours. 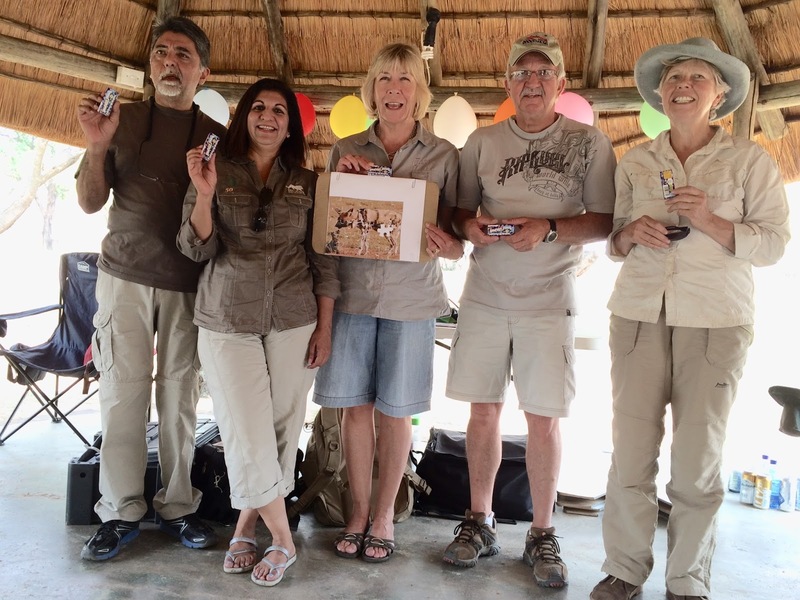 On Saturday morning, each team was given a decorated, colour-coded pizza box which contained some necessary items. Well done to the Blue team, who won The Amazing Race - Smarties! The tasks were to do with identifying plants, collecting samples of those and some dung, taking photographs of certain things and identifying some reptiles. 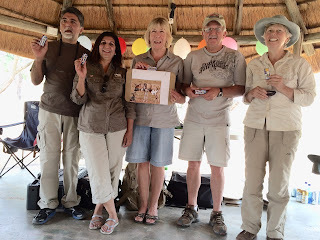 Each team received a puzzle piece for each correct answer and had to put together the puzzle pieces...then, on Sunday morning, give us all a short talk on the animal in their picture (Pangolin, Black Rhino, Wild Dog, Riverine Rabbit). On Saturday afternoon, three groups went through an hour-long rotation of photography, looking for the Python and interpreting a staged tracking scenario. 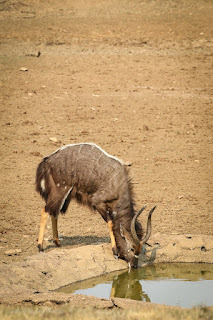 It was excruciatingly hot, but everyone drank plenty of liquid and managed not to get dehydrated. 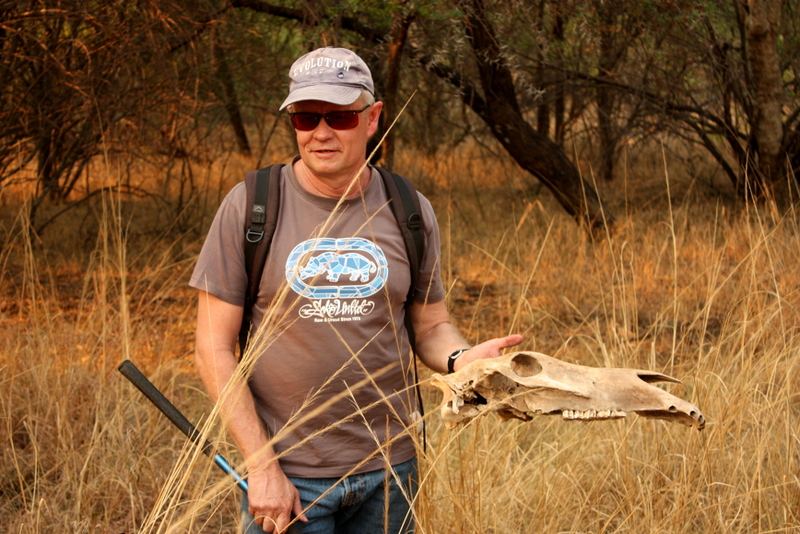 Below is Professor Alexander with a zebra skull that we found when we went searching for reptiles. He's carrying a tool that herpetologists call a 'stump ripper' - which looks a bit like a golf club - which is used to pull up dead logs and other debris, to see if snakes are underneath. The Prof was very disappointed that we never actually found any snakes, let alone the Python, but he did come across a snake skin! He cut this open (they shed their skin like we take off our sock, so inside-out) and counted the scales, (which is how you identify them, 19) and concluded that it was a Snouted Cobra...famous for being predators of Puff Adders. So that was very exciting! In a way, I think people were relieved that we didn't find a live sample. The area apparently isn't rocky enough to be good habitat for snakes. During one of the photography sessions, a beautiful male Nyala came down to drink at the dam...which is as dry as a bone, but there is a concrete basin into which they pump water for the animals. Shame, the poor thing could hardly reach the water, as it was a bit too steep on the sides. Anyway, that was a lucky sighting and everyone had a chance to practice their skills. We had sundowners at the dam and then returned to the campsite for a communal braai. Below is the lapa area (lesser bushbabies shelter in its roof!) and pool. It's a beautiful place to camp. 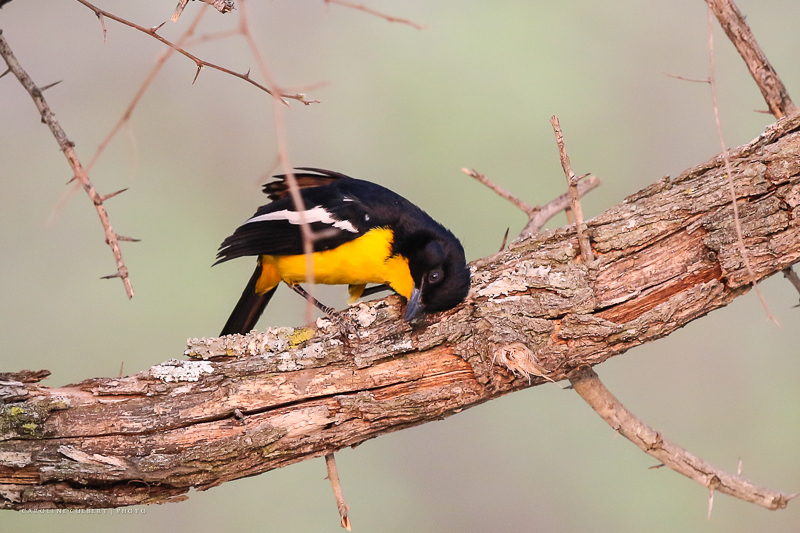 In the morning, we had an early start and set off in small groups and enjoyed a wonderful bird walk. Some of the highlights were a nesting Fork-tailed Drongo and a trio of Marico Sunbirds shouting at each other from the top of a tree, with their iridescent colours glistening in the sunlight! The Drongo chose a particularly silly place, given that the sun was very unforgiving and that she is black (therefore a heat sink) - it was a bare tree, out in the open. It would be remiss of us not to mention the rare and much sought-after yellow morph of the Crimson-breasted Shrike, which also made several appearances for us - what a special treat! Ps. Andre and Justin stayed late again and checked the camera trap that we had set up...the python apparently came out to bask from 12:39 until 13:03 about two metres from where she had originally been seen! Prof. Alexander said that she has not yet laid her eggs and so will probably leave the hole to find another nest site very soon. It would be great if we could find out where she goes – when the babies hatch, there would be a two week period where there would be many babies basking outside the hole throughout the day. Based on the assumption that she is about to lay, they are predicted to hatch in the second or third week of February.